A clarion call for the North of England to lead the Fourth Industrial Revolution with its legions of smaller manufacturers was made by a key industrial advisor to the Government’s Industrial Strategy team. Juergen Maier, CEO of Siemens UK and author of the Made Smarter Review, urged industry across the North to commit to embedding technology, information and data into everything they do. Speaking to an invited audience of northern industrialists and young engineers at the University of Sheffield’s Advanced Manufacturing Research Centre (AMRC), the man behind the industrial digitalisation review said a new digital Industrial Revolution could see 175,000 new jobs over 10 years, mainly skilled jobs in engineering, software and design. He said: “Leading the next Industrial Revolution cannot be done from Whitehall; it cannot be done from London. It can only be done in the North. “This city of Sheffield was world-renowned for high-quality steel production, but fell into decline as the industry collapsed and cheaper alternatives across the world became available. We should all be determined that we do not let this happen again. His sentiments were echoed by Professor Sir Keith Burnett, President and Vice-Chancellor of the University of Sheffield: “As the cradle of the first industrial revolution, the north of England sent new products to the world. Now we need the infrastructure, research, innovation and skills which will enable us to lead in the era of Industry 4.0. But Maier said that a major obstacle to this revolution remains a lack of awareness of among smaller and medium sized companies (SMEs) – only 8 per cent of manufacturing companies understand industry 4.0 or digitalisation, and 76 per cent have no understanding at all. This, coupled with a fear of change and automation, has led many companies to shy away from incorporating cutting-edge technology. 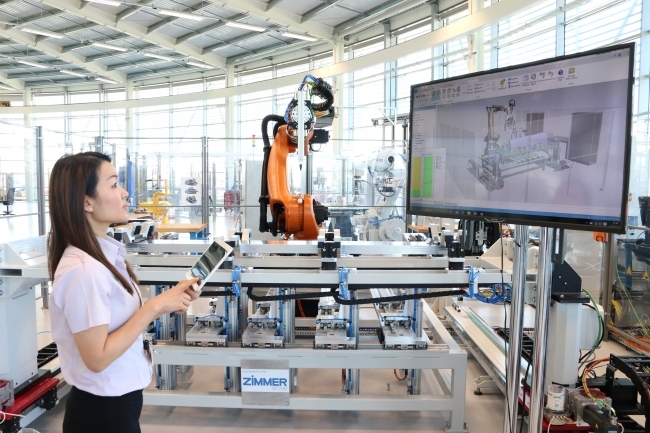 Maier was speaking at the AMRC’s flagship Factory 2050, where industry comes to de-risk the implementation of digital technologies, from robotics and automation, virtual and augmented reality, and Artificial Intelligence and machine learning. Ben Morgan who heads Factory 2050’s Integrated Manufacturing Group amplified the clarion call from Siemens’ CEO. “Juergen’s message is a wake-up call for industry across the North of England. If we don’t exploit these technologies to the full, manufacturing in the UK will continue to be vulnerable to competition from early adopting countries across Europe and the Far East. “Ensuring that companies across the North and the Midlands get access to the productivity benefits of the next Industrial Revolution is vital if the UK is to remain globally competitive. 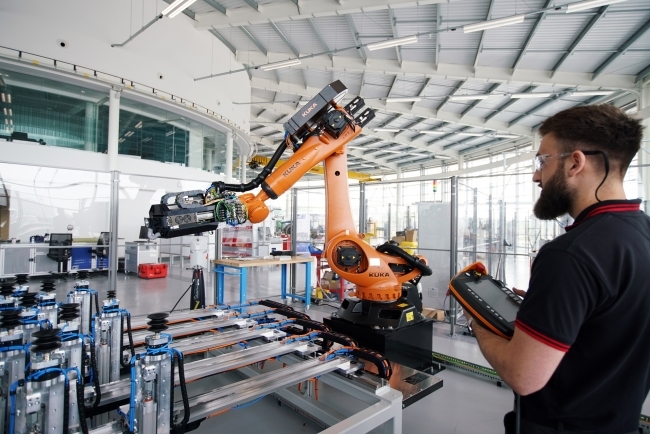 The University of Sheffield AMRC has a global reputation for supporting companies in de-risking this technology; so much so that we are now looking to expand with centres in the North West, North Wales and the Midlands, giving local SMEs the access to these technologies on their doorstep, which is what so many of them need. Siemens, who are a partner at the AMRC, have also demonstrated their commitment to innovation and manufacturing in the North – recently announcing plans for a proposed £200m state-of-the-art factory in Goole, East Yorkshire, to manufacture and commission the trains of the future. Professor Maier’s speech was preceded by a roundtable discussion on skills at the Sheffield UTC, exploring how to ensure the Northern Powerhouse can deliver a skilled workforce to tackle the jobs of the future. Northern Powerhouse Partnership Director Henri Murison concluded: “The next Industrial Revolution is going to transform the lives of future generations; leading this technological revolution from now will change the future for those growing up here today.